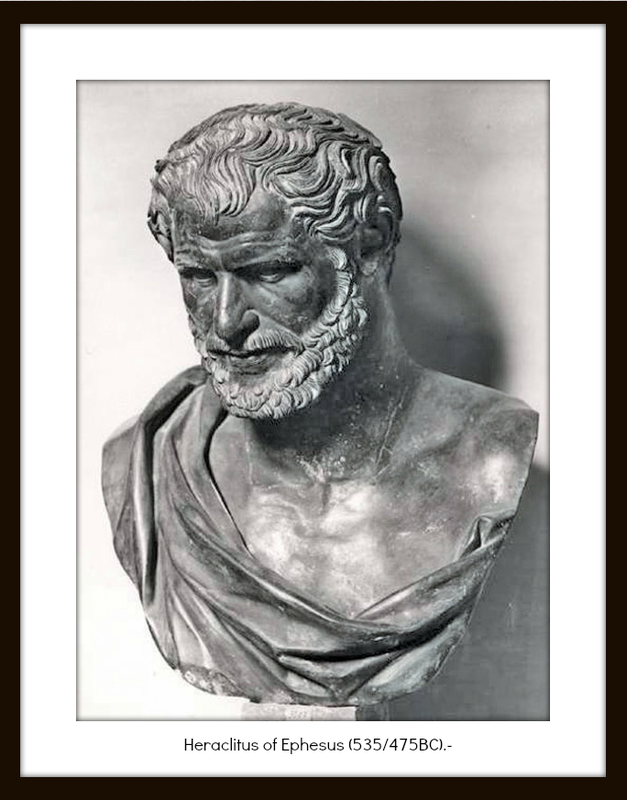 The central idea of Heraclitus’ thought is undoubtedly the unity of opposites. Moreover, Heraclitus claimed that all things are one. This ‘unity of all things’ is based on the fact that there is a common formula, i.e. logos, which is at work in everything to which we attribute temporal and spatial identity and continuity. Heraclitus should not be misunderstood as denying the phenomenal difference between day and night, hot and cold, up and down, and even death and life, rather, his claim is that each opposite is inseparable from its other, and that they depend on one another for their own identity. In other words, if one of the pair is removed the other immediately disappears. Heraclitus’ famous phrase that “you can’t step in the same river twice” should be understood as the claim that things which seem to have a stable identity, in fact depend upon a continual interchange or succession of their constitutive parts, or outright antagonistic forces, for their identity. (3) everything is and is not at the same time. In other words, Universal Flux and the Identity of Opposites entail a denial of the Law of Non-Contradiction. Plato indicates the source of the flux doctrine: “Heraclitus, I believe, says that all things go and nothing stays, and comparing existents to the flow of a river, he says you could not step twice into the same river” (Cratylus 402a = DK22A6). There is an antithesis between “same” and “other”. The sentence says that different waters flow in rivers staying the same. In other words, though the waters are always changing, the rivers stay the same. Indeed, it must be precisely because the waters are always changing that there are rivers at all, rather than lakes or ponds. The message is that rivers can stay the same over time even though, or indeed because, the waters change. The point, then, is not that everything is changing, but that the fact that something change makes possible the continued existence of other things. Perhaps more generally, the change in elements or constituents supports the constancy of higher-level structures. As for the alleged doctrine of the Identity of Opposites, Heraclitus does believe in some kind of unity of opposites. “God is day night, winter summer, war peace, saciety hunger” (DK22B67). “What opposes unites, and the finest attunement stems from things bearing in opposite directions, and all things come about by strife”. (Fragment DK22b8). “The path up and down is one and the same”. (Fragment DK22b60). Click here to read my comment on Christy´s poem. (As Regard to Heraclitus´Doctrine of Unity of Opposites”). →As there are no specific rules here I will set up a few ones. I will be nominating three blogs for each one of the Awards I choose. 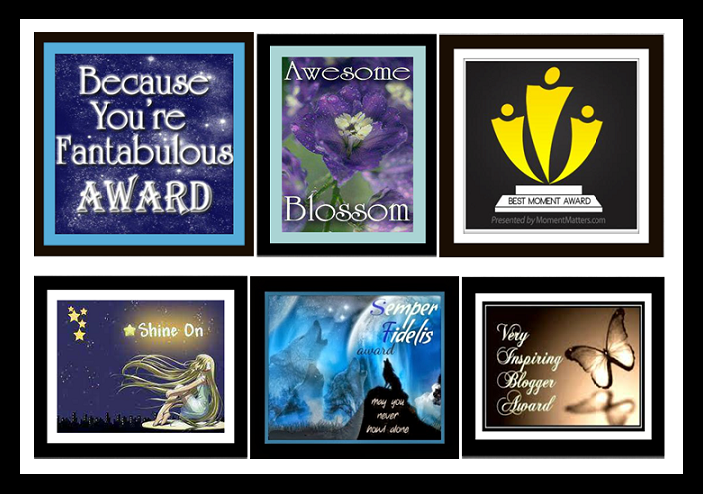 These blogs will have freee access to choose awards from the six awards available. They must nominate three blogs per Award, always linking back to the blog which has nominated them. →Como no hay reglas específicas aquí, estableceré algunas. Nominaré tres blogs por cada uno de los premios que elija. Esos blogs tendrán libre acceso derecho a elección de Premios. A su vez, deberán nominar a tres blogs por premio y enlazar al blog que los ha nominado. Nominados / Nominees (18 Blogs, 3 x 6): Poetic Parfait, Kourtney Heintz’s Journal , Chesterton Blog, Kirbysdawblog, D. A. Lavoie, Nómadas, Gigi papillon rose, Mon coin du français, El Mirador, Salvela, Rotze Mardini, Los Sentidos de La Vida, Clowie´s Corner, Syl65, Irina´s Poetry Corner, Anatomía de la Intimidad, The Regular Guy NYC, Dreamwalker´s Sanctuary. Awards to Choose / Premios para elegir (6 Awards): 1) Because You are Fantabulous Award. 2) Awesome Blossom Award. 3) Shine On Award. 4) Semper Fidelis Award. 5) Very Inspiring Blogger Award. 6) Best Moment Award. Me pareció fabuloso. Saludos desde Guatemala. Lo único que permanece es el cambio. Heráclito anticipó a Kant que consideraría al tiempo y al Espacio como categorías a priori de la Razón Pura. Muy buen post. Eva; Muy acertada la línea que marcás en relación a Heráclito y Kant. Comparto tu punto de vista. Oh dear sweet friend! Thank-you for bestowing me with a lovely award and including a link to the ♣Waltz♣ ! Much love! As for your post itself, so interesting is the talk of opposites – that two such different things can really be the same & we only know one because of the other — well it just speaks volumes, with multiple levels. I agree that we are always changing, even when the change is not immediately visible. Such interesting thoughts here. LOVE you, sweet orange half! Really… Okay I will add it as a twitter here. Thanks, that was very kind of you to do that. Just between you and me, I think that Heraclitus´ doctrine of unity of opposites may apply to our friendship, particularly because it involves lots of good things and also a few bad ones. But at the end opposites link up, so the wholeness (Friendship) is what counts . Thanks for your words as regard to my blog. How lovely AP to come back and re-read our comments here at your post. This was early in the year and now we are soon to enter into 2015! Your post was great to read over again and I am happy LADA is enjoying much success! Thank you my dear friend for thinking of my Blog. In both our name of mine and Gigi’s, I will choose 4 of them (since I have some of them already) and and follow your rules. I can only say thanks and…cheers beautiful Princess of Argentina! Delvi. It is my pleasure to nominate you & Lady Miracle Gigi. Well deserved. Hope to catch up with you very soon as I am a little bit behind. An award for you, dear http://familyanswersfast.wordpress.com/thank-you-%E2%9D%A4/ Thank you for your many kindnesses and I’m eager to read your most recent and always thoughtful post. I am really flattered !. Thanks a lot for the nomination … But I already have The Shine On Award and also the other two awards. That´s a pitty. Anyway, I´ll mention you in my next post and link you back. Oh thanks Angie that was so sweet and witty. Heraclitus makes a lot of sense to me, and Christy Birmingham’s beautiful poem talks about the same thing: the movement of opposites is the essence of life. Thanks, Aquileana, for another lovely post. And congratulations on all your wonderful awards! Thanks a lot for your comment. Truly thoughtful I am glad that you enjoyed the post here and thanks on Behalf of Christy for having mentioned her “Waltz of Black and White”. 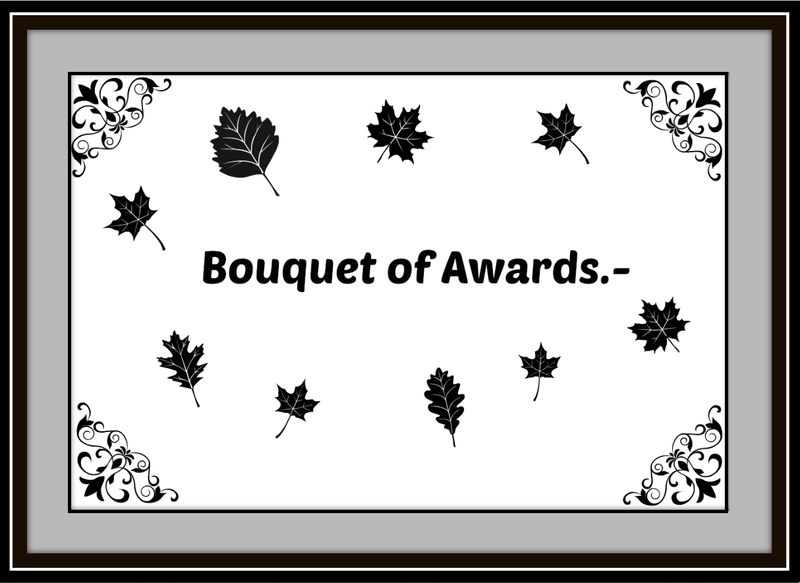 I am adding you to the nominees for the Bouquet of Awards. I just don´t know how I forgot your lovely Poetic Corner. So if you are interested feel free to go after them. Hello Leah, You do as you want sweetie. I found this fascinating, it seems similar to the philosophy of yin and yang. Congratulations on your awards and thank you for including me! Good point here. Ying and yang are in fact related with Heraclitus´s doctrine of Opposites; Clowie. It was my pleasure to nominate you Kourt. I truly enjoy reading your posts. I love the last quote. Congratulation for the award and thanks so much dear Amalia for nominate my blog. It is my pleasure as ever. So glad to know that you have enjoyed the post here Rozte. Congrats on your awards and thanks so much for the nominations! I am flattered. It was my pleasure to nominate you Phil. Si tuviera que elegir entre el racionalismo duro de Parménides -nada se mueve, todo movimiento es una ficción- y el de Heráclito, me quedaría con éste. Pero también podemos aceptar que hay un cambio y una permanencia a la vez. Es la paradoja. Quizá me sienta deformado por mi visión chestertoniana e incluso cristiana de la vida -para ganar la vida hay que perderla- pero pienso que los razonamientos del tipo y/y son mucho más poderosos que los del tipo o/o, porque la vida es así: no somos sentimiento o razón, sino sentimiento Y razón a la vez. Por eso todo resulta tan interesante. Siento que mi inglés no esté a la altura para escribirlo todo en esa lengua, sorry. Enhorabuena por los reconocimientos, y gracias por tu nominación. ES interesante la fusión cultural histórica que planteas respecto al Cristianismo. (“-para ganar la vida hay que perderla- “). En cuanto a la visión de Chesterton respecto al Cambio y la Permanencia, no estoy al tanto Si tienes algún enlace en tu blog, seguramente puedas sugerírmelo en algún momento aquí o allí. Es un gusto haberte nominado. Y una acotación respecto a cómo es eso d elos blogs que seguís. En escritorio consultás BLOGS QUE SIGO. y una vez en el panel de WORDPRESS READER, vas a LECTOR. Así aparecen todas las actualizaciones ordenadas en forma cronológica de los blogs que estás siguiendo. Mi intención es colgar el relato entero en cuanto podamos, pero hay algo de cola… Es decir, disponer ‘los colores en la paleta y no en el lienzo’ es una idea bastante contraria al determinismo ‘fluyente’ de Heráclito!!! Respecto al Chesterton, no sabía esto de que era constructivista. Pasaré a la brevedad por tu blog para leer el artículo que enlazabas. Thank you Poet/sis for the nomination. Truly appreciated. I’m just the poet in the background, observing life. You’re awesome sis! I hope you are getting ready for the weekeend . I will catch up with your newest poems soon. PS: The poet in the backgroudn seems to have a great perspective of the whole picture !!! That´s a god way to see it, Carl…Many thanks for stopping by. Best wishes !. Merci pour votre passage sur mon blog. Your blog is very interesting and i totally agree with the thought of Heraclite. the opposites live only through their links and everything change. The only thing that subist is the snapshot of this image we’ve conserved of the river, but in reality it’s not the same. Sometimes, when something deeply occurs in us, we realize this fact. We say that our regard has changed or our point of view. Thanks for stopping by… Yes you are right : only the “image” of the river remains the same. Therefore we would never see the same river with the same eyes as we tend to change and also the river and its surroundings never stop changing. I´ll visit your blog soon. Merci pour tes pensées. Great post. Keep it up, I really like Philosophy. Muy merecida, que disfrutes de los Premios. Libre disposición (de uno a seis, tres nominaciones por cada uno). Todo tuyo. Finding unity in the opposites — what a beautiful way to put it! I used to only think of light and darkness as complementing each other, but now I can say that there is unity in their difference. Thanks for this lovely lovely post, Ms A. Thanks for dropping by Ms A. Yes, opposites have more things in common than we should have expected. Well, at least this is Hercalitus way of seing them. Unstoppable change and unity of opposites. I am glad that you enjoyed the post, thanks also for the nominations, I am very happy for the awards… Enjoy your weekend , Hugs & all the best for you. You are very welcome Ajay !!! Very interesting ancient readings, to the man can’t strip into the same river twice. It is true. It kind of reminds me of the idea of complements in Taoism. Very intriguing post. Glad you found it interesting, Kourtney. The doctrine of unity of opposites may be related to taoism (but I think Heraclitus was first, though). I am happy to read your comment here. Thanks for your insights and also on behalf of Christy Birmingham. I now she´ll appreciate your words. xo 🙂 Nice to hear from you. I will certainly come back. This last line left me thinking in Saint Anselm of Canterbury (1033–1109), who held his “monologion” that “Things are called good in a variety of ways and degrees, which would be impossible were there not some absolute standard and some good in itself, in which all relative goods participate”. I love to share understanding about this topic as you did previously with me. That way, knowledge will be accumulated with the years. Hace pocos días he comenzado un web, la información de tu blog me proporciona mucha ayuda. Gracias por todo, tu tiempo y trabajo. Creo Aquileana haber correspondido a tu gesto amabilísimo hacia mí en el modo posible y con agradecimiento. Has sido muy amable. En fin, con mi nuevo saludo, se añade la alegría de mandarte un buen abrazo. Interesting, I was just mentioning ‘flux’ in your previous post. Heraclitus is considered to be the first existentialist bona fide. He was one Nietzsche’s favourite philosopher. It might sound paradoxical but change is the immovable variable of our existences.. The ‘self’ does not exist, it is constantly in FLUX. So who am I? I am only the moment, the present. This latest thought of you may apply not only to buddhist philosophies but to Heraclitus, as you have also well pointed out. You’re welcome! Duc de La Rochefoucauld also influenced Nietzsche. His book on ‘Maxims’ also deals with the unity of opposites. I loved that book. Desde su perspectiva el Logos se relaciona con el elemento primordial Fuego… Y creoq ue no es ajeno al concepto de Ratio tampoco. Down is up & up is down. What!? http://t.co/x0SkzLQepQ @aquileana Heraclitus of Ephesus: "The Doctrine of Flux & the Unity of Opposites"